The Andaman and Nicobar Islands is one of the seven union territories of India, are a group of islands at the juncture of the Bay of Bengal and Andaman Sea. It comprises two island groups, the Andaman Islands and the Nicobar Islands, separated by the 10°N parallel. The territory's capital is the Andamanese town of Port Blair. The total land area of these islands is approximately 7,950 km2 (3,070 sq mi). The capital of Nicobar Islands is Car Nicobar. Barren Island is located in the Andaman Sea, one of the most easterly Islands of the Andaman Islands. It is the only confirmed active volcano in South Asia. 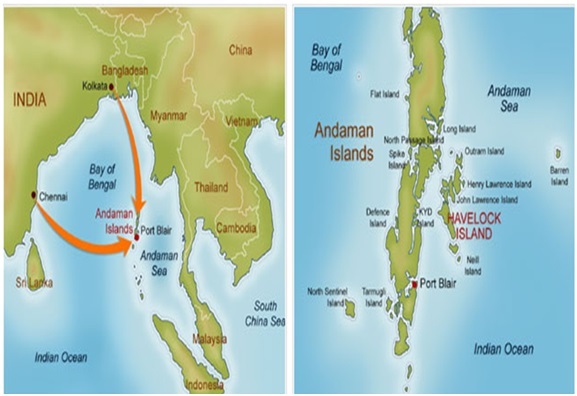 Along with the rest of the Andamans, it is a part of the Indian Union Territory of Andaman and Nicobar Islands, and lies about 135 km (84 mi) northeast of the territory's capital, Port Blair. The first recorded eruption of the volcano dates back to 1787. Since then, the volcano has erupted more than ten times, with the most recent one which started in September 2010 and continued through January 2011. This volcanic island stands in the midst of a volcanic belt on the edge of the Indian and Burmese tectonic plates. Narcondum is a dormant volcano in the area, apart from volcanic seamounts like Alcock and Sewell. Shyam Nagar, Nabagram, Mayabunder, Uttara, Checkpoint, Herbertahad, Bamboo Flat,Wrightmyo, Port Meadows, Wandoor. A total of 48594 hectares of land is used for agriculture purposes. There are 3 newspaper and 22 periodicals and 316 schools. Installed capacity of power generation is 30,000 kw with all revenue villages are electrified. There are 1421 registered small scale villages units ie. Fish processing factory, soft drinks, beverages, PVC conduit pipes, paints.